I started on violin at age 5. I was the middle child, and my older brother James played cello while my younger brother Simon also played violin. When I was 8, James suggested that I try the viola. I took to it right away. Every once and a while I still play violin, but I’m first and foremost a viola player. Growing up I always loved chamber music. I had a quartet with Simon for most of our childhood. Compared to a lot of musician friends I’ve talked to over the years, I wasn’t too much of a classical music nerd. I did really like the ECM Kim Kashkashian albums, and many of those were my first introductions to contemporary music. As a teenager I became interested in painting and visual art. I think that influenced me a great deal in terms of how I thought about music, classical or otherwise – all the arts are living and connected, expressing many of the same ideas and emotions through their respective mediums. As an undergrad at San Francisco State University I randomly took an Introduction to Electronic Music class with Josh Levine. He is a passionate and very entertaining teacher, as well as an excellent composer, and he really opened my mind to new music. I was also a huge Smashing Pumpkins fan. In a nutshell, love/hate, with an emphasis on love. To be specific, I absolutely love the viola. I love the sound, I love the violist role in a string quartet. I really can’t imagine life without it. But on bad days, when things are not working and practicing seems to only be making things worse, it can get really frustrating. I’m sure it’s the same for all performers. I’ve done some singing in choirs and bands, and in a way I feel jealous of vocalists. Not that what they do is easy by any means. I’m jealous of the flow between the imagination and the technique of sound production. We strive as instrumentalists to have absolute fluidity between our musical ideas, our technical execution, and the resulting sound. When I can achieve that on the viola, I’m happy. It goes without saying, but I’ll say it anyway – establishing Mivos Quartet in 2008 has literally changed my life. We have an amazing musical connection, and as we travel the world performing we meet so many great musicians, colleagues and friends. Heck, I even married one of the violinists! Learning and recording the Sciarrino Tre Notturni Brillianti was also a big step for me. I love those pieces and had been intimidated by them until a few years ago. After that performance, I felt much more sanguine about learning heavily detailed scores, and I started using a color system for markings. Simply moving to New York City was huge. The creative energy and vitality all around is unlike any other place I’ve ever been. I learned how to really work by coming to New York. As a musician specializing in contemporary music, every new piece is a new artistic challenge. We’re often asked to learn a new notation system or a brand new performance technique, and I really enjoy the challenge of discovering how to make things work. I find that learning new techniques gives me a fresh perspective on my basic sound production. Thinking of “challenges” in terms of goals, a big one I have is to expand my knowledge and vocabulary of intonation systems. In Mivos we spend a lot of time working out the appropriate tuning for a piece – just tuning, microtonality, difference tones for reference, and so on. I’d like to get much more nerdy with the specifics of tuning. Another perennial goal is to remove unnecessary tension from playing. On the road, muscle soreness and fatigue can really sneak up on you. It’s important to actively seek out ways to remain relaxed while playing, especially when working on physically aggressive pieces. Most of my work is with the quartet, and I always start by looking through the score and marking in any cues or references I think I’ll need in my part – first relating to the rhythmic grid, and then any passages in octaves or unison. From there, each piece might need its own approach, but I always want to know these two basic elements up front. More traditional or tonal pieces are often more straightforward and require fewer markings, but I always start a piece in the same way. The short answer is that, if the composer is alive and available to consult, they get the final say. We’re at a great advantage in new music in that we can almost always know what the composer wants. 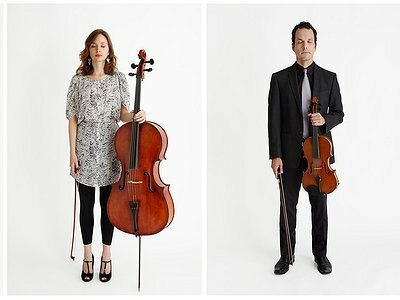 In the quartet, we’ve established many deep collaborations with composers. In that scenario there is a lot of back and forth with the composer – reading through drafts, experimenting with sounds, working out how best to notate things. This really is the ideal situation, where the composer has a specific performer in mind, and we can all bring our expertise to the table in order to arrive at the most expressive and succinct result. In that way there is no dichotomy between the composer’s intent and my interpretation. We work together. I’ve also had the experience where a composer chooses to notate or describe something that has already been codified in a completely different way. Sometimes they have a point, and the resultant sound or expressive effect is palpable once I work on it. At other times, it seems like the composer’s intellect is getting in the way of their actual musical idea, and I feel it is my responsibility as the performer to get at the core of what I think the composer wants and show them the clearest way of achieving that. Not to diminish the role of the individual in the creative process, but I do tend to view the making of art as more like tapping in to an ineffable creative energy. We discover some amazing things while under the spell of that energy, and we, each in our own way, sculpt it into something meaningful and tangible for ourselves and for an audience. We all have to let go of our egos at some point to better serve the greater artistic good. In general, there shouldn’t be any “shoulds” in the arts. The idea that art is obliged to do anything in particular is a strange one to me. I see little harm in letting the arts be as free and open as possible, allowing time to be critic enough. The previous doesn’t really answer your question, though. I feel that context is everything, and that part of my job as a musician is to try to adjust to each situation as it comes up. If a lawyer or waitress, both of whom may work 40-80 hours a week, happens to come to my concert on a Thursday night, how can I reasonably expect them to appreciate the nuances between French and German Spectralism? They don’t have time or interest to keep up with the esoteric minutiae of the new music world, and why should they? Music is best when it speaks for itself, and I honestly believe that a passionate and rigorous performance enhances everyone’s chances of having a good time at a concert. With all that being said, I also see nothing wrong with explaining a piece with a few words, or simply breaking the ice with the audience by saying something about the intent of the concert. Music, by its very nature, is ephemeral and can only be explained in words in a very general way. Anything I can do to put the audience in a receptive mindset is worth doing. We discover some amazing things while under the spell of that energy, and we, each in our own way, sculpt it into something meaningful and tangible for ourselves and for an audience.